Members of the Tunnel 9 team are pictured with the electrical rectifier unit recently put into use. The unit, which was first delivered and installed in 2011, will replace an approximately 50-year-old power unit at Tunnel 9. 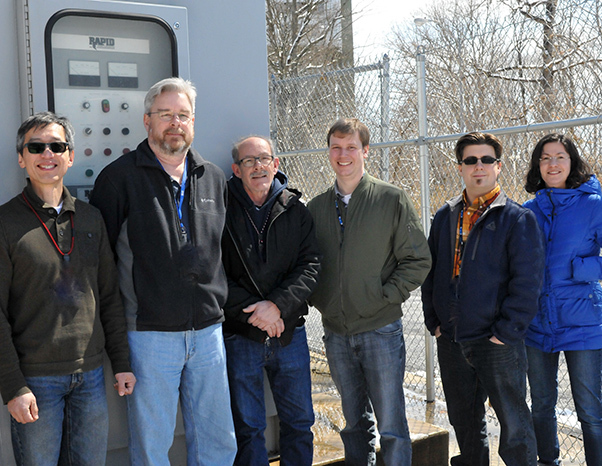 Pictured from left are Electrical/System Engineer Tao Lee, Controls Engineer/Lead Controls Technician Ray Schlegel, Lead Electrician Ed Tierney, Chief Facility Engineer Nick Fredrick, Electrical/Data System Engineer Joel Barr and Test & Evaluation Engineer Inna Kurits. 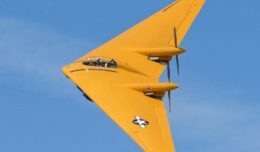 The team at the Arnold Engineering Development Complex’s Hypervelocity Wind Tunnel 9 in White Oak, Md., is now putting to use equipment installed several years ago – a move that is bringing enhanced safety and greater longevity to the facility. 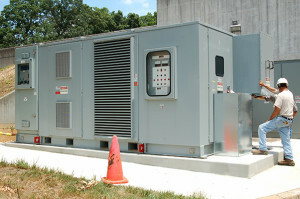 An electrical rectifier unit, first delivered and installed in 2011, was recently put into operation for the first time. The rectifier is intended to replace an approximately 50-year-old unit that is nearing the end of its lifecycle. The rectifier is an electrical power pack designed to provide variable high-current power at low-voltage conditions to the Tunnel 9 heater system. Tunnel 9 Test & Evaluation Engineer Inna Kurits said the upgrade is part of the Service Life Extension Program (SLEP) effort to modernize the facility to ensure it can continue supporting its customers for many years to come. According to Tunnel 9 Director Dan Marren, the rectifier was purchased when funding could be allocated to Tunnel 9 priorities. Due to a busy customer schedule, the rectifier was installed with a switchgear that allowed operation of the existing, aging transformer to nurse that hardware along until funding could be secured to finish the new rectifier. The electrical rectifier at AEDC Hypervelocity Tunnel 9 is bolstering safety and the facility’s lifespan. The unit, which was first delivered and installed at Tunnel 9 in 2011, was recently put into use to replace an approximately 50-year-old power unit. The original power pack at the facility was an alternating current (AC) unit, while the new rectifier is a direct current (DC) unit. The rectifier converts 13.8 kV AC from the power grid into approximately 150 V DC at 5,500 Amps for the Tunnel 9 heater, according to Tunnel 9 Chief Facility Engineer Nicholas Frederick. Integrating the new unit with the existing Tunnel 9 systems and processes was a multidisciplinary team effort, Kurits said. She said challenges faced included figuring out how to safely switch from AC to DC operation, how to integrate the new unit into the control system, and how to modify facility procedures to accommodate the upgrade. According to the team at Tunnel 9, the upgraded rectifier has proven to be successful and has also boosted safety at the facility. “Being a new piece of equipment, the rectifier also adds an additional element of safety as it is equipped with its own High Voltage breaker, safety relays and emergency shut-off button,” Fredrick said.